This leaf is identified by Ege as an Italian lectionary from the mid twelfth century. The vellum is thin, supple, and barely yellowed, measuring 33 x 24cm. 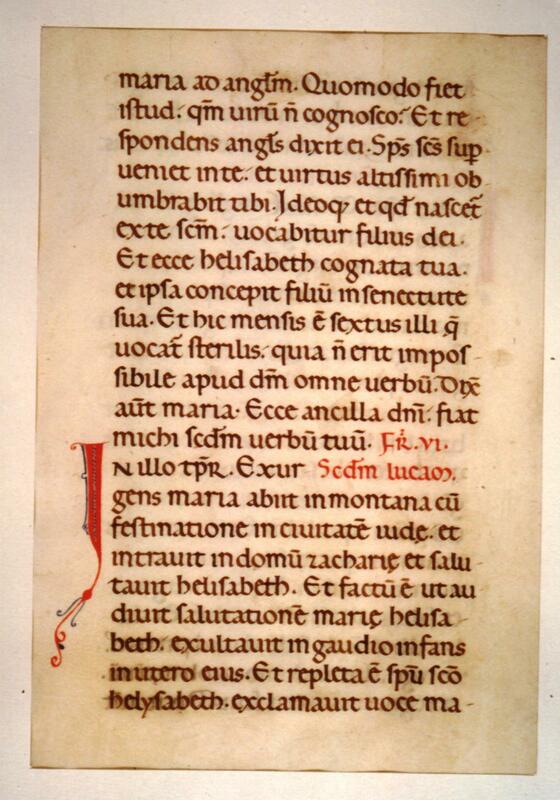 The text is revived Carolingian minuscule, another example of which can be seen in Leaf 01. The ink is primarily dark brown with minimal fading with phrases highlighted in red and blue. This particular page from the lectionary must have been taken from the Christmas mass, for it contains Luke 1, the most famous telling of the Christmas story. See Denison University Leaf 03 for more information on this manuscript. Text: Luke 1:34-42 (verso). A scan of the recto of this leaf is currently unavailable. María ad ángelum: Quómodo fiet istud, quóniam virum non cognósco? Et respóndens ángelus dixit ei: Spíritus Sanctus supervéniet in te, et virtus Altíssimi obumbrábit tibi. Ideóque et quod nascétur ex te sanctum, vocábitur Fílius Dei. Et ecce Elísabeth cognáta tua, et ipsa concépit fílium in senectúte sua: et hic mensis sextus est illi, quæ vocátur stérilis: quia non erit impossíbile apud Deum omne verbum. Dixit autem María: Ecce ancílla Dómini: fiat mihi secúndum verbum tuum. 34 And Mary said to the angel: How shall this be done, because I know not man? 35 And the angel answering, said to her: The Holy Ghost shall come upon thee, and the power of the most High shall overshadow thee. And therefore also the Holy which shall be born of thee shall be called the Son of God. 36 And behold thy cousin Elizabeth, she also hath conceived a son in her old age; and this is the sixth month with her that is called barren: 37 Because no word shall be impossible with God. 38 And Mary said: Behold the handmaid of the Lord; be it done to me according to thy word.